Dress weather is the best weather, and with spring finally here, we’re experiencing the best dress weather of the year! We’ll never have enough dresses. Not because we feel like we never have anything to wear, but because we just love them so much and want them all. That’s why when we find a dress we love, we want every color and pattern possible! There are 36 versions of the QIXING Women’s Summer Cold Shoulder Dress available and we think somebody needs to fan Us because we’re overheating with excitement. But the excitement doesn’t end there; this dress comes in both short sleeve and long sleeve versions! 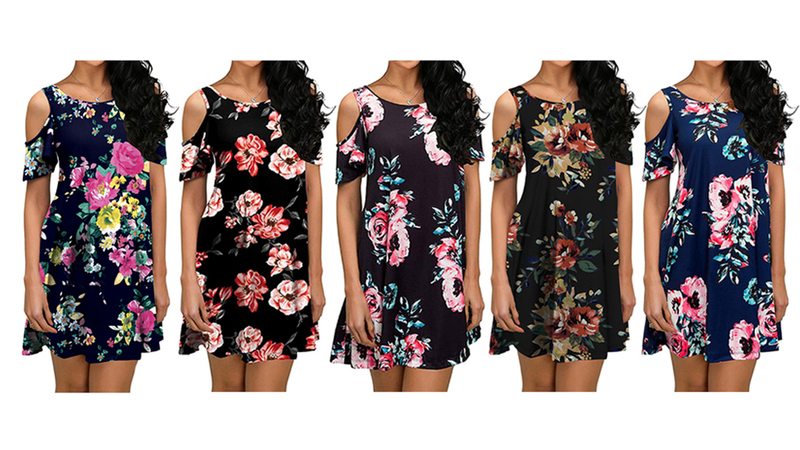 See it: Get the QIXING Women’s Summer Cold Shoulder Dress starting at just $13 at Amazon! Please note, prices are accurate at the date of publication, April 12, 2019, but are subject to change. Nearly 1,500 shoppers are leaving amazing review after amazing review, not able to get over how high quality this dress is. So many are highly recommending it to others, as they receive so many compliments every time they wear it. One shopper, who declared themselves addicted to this dress, bought multiple to try on for a wedding and actually ended up keeping all of them! Others reported on wearing their dress to outdoor parties or the office. Basically, this piece is incredibly versatile. This main feature of this charming swing dress is the cut-out shoulders. They’re called “cold shoulders” but they’re much cuter than the usual angry connotation of the phrase. On the short sleeve version, just below the cutout is a butterfly-style sleeve, ruffling gently and landing just above the elbow. On the long sleeve version, the sleeves make their way down to the wrist! One thing we know everyone is going to love is that there are actually pockets hiding in this jersey-knit dress! Roomy ones, too! Another roomy thing everyone will love? The “generous” fit, which is just loose enough to provide comfort while still maintaining our shape. This dress has a little bit of stretch too, as it’s made partially with spandex! This dress features a round neckline and a fluttering hem which hits just above the knees. It flares out slightly at the skirt, but we can add a belt for an even more flattering effect if we want! There are many solid colors available of this dress, including pink, blue, wine red, army green, black and dark grey to name just a few. Pattern-wise, there is a whole group of florals to choose from and every single one is beautiful in its own way! From sunflowers to waterlilies, we’re bound to find a print that speaks to us (and looks adorable on us, too)! Styling this dress is so easy because it looks great with everything from sandals, to heels, to thigh-high boots. Some of the floral shades are just begging to be worn with a floppy beach hat, too! We hope that’s a challenge, because we accept. Now we just need a cute bag, stylish sunglasses and a whole bunch of sunscreen! See everyone at the beach; we’ll be the ones in this dress! Not your style? Check out more from QIXING here and other dresses available at Amazon here!